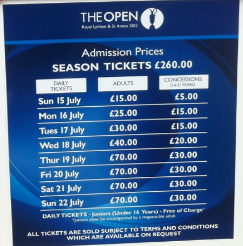 Planning for The Open Championship 2013? Nice view to the range at The Open Championship 2012 at Royal Lytham & St Annes. My colleague Mane wrote about our The Open Championship 2012 experiences and already shared some details for everyone who is planning to attend the event. Some of you already asked for more details, so here’s some. Any idea to attend when the practice rounds are played? Yes, at least for us it was. The practice day on Wednesday was a great opportunity to get autographs from your favorite players, photos and watch how the pros prepare for a tournament. You should go to the range and chipping green to follow the routines – you’ll learn a lot! 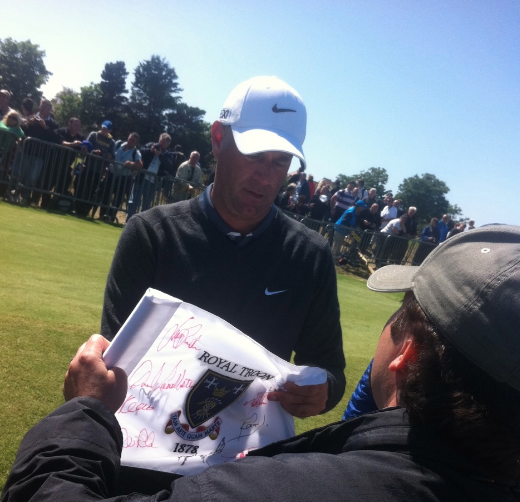 British Open Champion 2009 Stewart Cink signing diligently. For example, it was fun to see Tiger Woods show up on Wednesday afternoon to hit a few balls. Absolutely awesome how low he can keep the wedge shots, none finishing more than 10 feet from the target pin. Enjoyable to follow. Tiger Woods focusing in the range, with excellent results. Many of you wondered if the fun costs a fortune. No, it does not, the daily ticket price for adults was GBP 70 and for the concessions (evening hours between 16-21) GBP 30. Reasonable for a top event like this. Volunteers are very friendly and always smiling especially when the sun was shining. And the tournament organization does a great job to facilitate big crowds – no wonder having 141 years of experience organizing a major event. Exactly as Mane wrote in his earlier post, everything was well organized and the atmosphere was warm (despite of the weather). People in general respect the game of golf and are very knowledgeable about it.We met several interesting people and heard them share great stories from their golf history. The overall culture around golf in the UK seemed to be very balanced, respectful and warm. Very helpful volunteers taking care of a lot of things. Ah, a classic subject in the UK! We were fortunate to enjoy mainly calm and sunny conditions, but the course and spectator areas were already muddy and wet. If there is any more rain, make sure to wear appropriate shoes to walk around the swampy rough. Waterproofs are a must – forget the umbrella. Mane says > Tiger – Mane was most impressed about TW’s controlled fade on #1 resulting a birdie. I say > G-Mac – looks in total control and comfortable in this new clothing line.